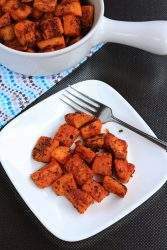 Spicy Oven Roasted Sweet Potatoes is just the perfect side dish for the Thanksgiving meal or any fall gathering. This recipe is a perfect balance of sweet and spicy. Preheat the oven to 425 F. Grease a baking sheet with oil and keep it aside. Peel and clean the sweet potatoes. Chop it into 1 inch cube pieces and place it in a large bowl. Add the oil, salt, pepper, chili powder, garlic powder and roasted cumin powder to the bowl and toss the sweet potatoes to mix them up. Place the sweet potatoes on the prepared baking sheet in a single layer. Bake the sweet potatoes in the oven for 12 to 15 minutes. Remove it from the oven and then flip the pieces a few times and return to the oven and bake further for 10 to 15 minutes or until golden brown and well roasted. Let it cool a bit and then serve!